This isn’t a game set in an academic location, but as it’s a game about academic publishing and research I’ll just about include it here. 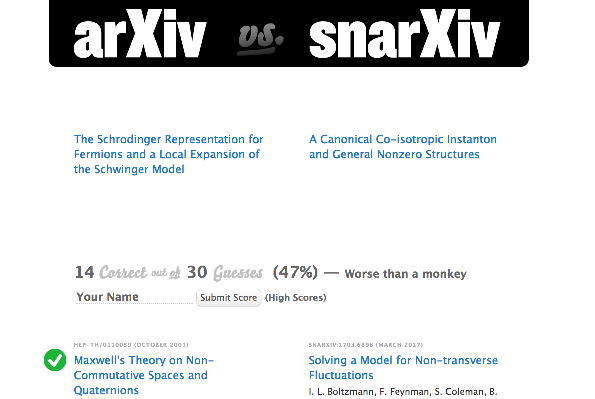 You can play arXiv vs. snarXiv online. It’s quite simple; guess which one of the two paper titles presented is the real one from the arXiv.org e-Print archive. And try not to pick the one which has been pseudo-randomly generated. It’s slightly worrying (but also personally comforting) that, looking at some of the accumulated scores, many papers have a success rate of only just over 50%. Maybe hardly anyone from the world of physics has played this game, making the quotients of plays mostly guesswork. Or, maybe a lot of physics academics do play the game and they are just as confused as the rest of us; I don’t know. Anyway it’s good fun for a while, until I finally remind myself that I am completely guessing and any feelings that I am applying intelligence on my part are delusional and false.